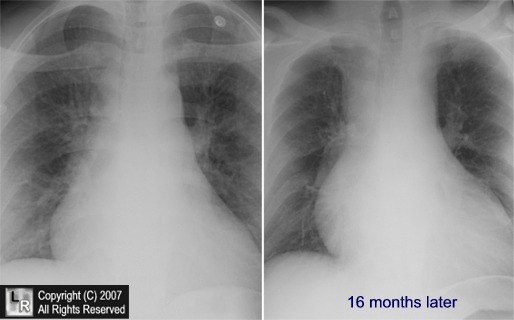 Mediastinal lipomatosis. Two frontal radiographs of the mediastinum taken 16 months apart after the patient had been taking exogenous steroids for asthma show smooth and symmetrical widening of the mediastinum (white arrows) due to increased deposition of fat in the mediastinum. For additional information about this disease, click on this icon if above.